Glue aims to improve conference calls by using VR avatars to represent body language and non-verbal communication. “VR can be an isolating experience, but what we want to do is bring people together. It’s even cooler if you can bring them together remotely,” says Santtu Parikka, chief executive of Helsinki-based VR firm, Glue. Glue wants to change the way businesses communicate and collaborate through its new online VR conference call solution. 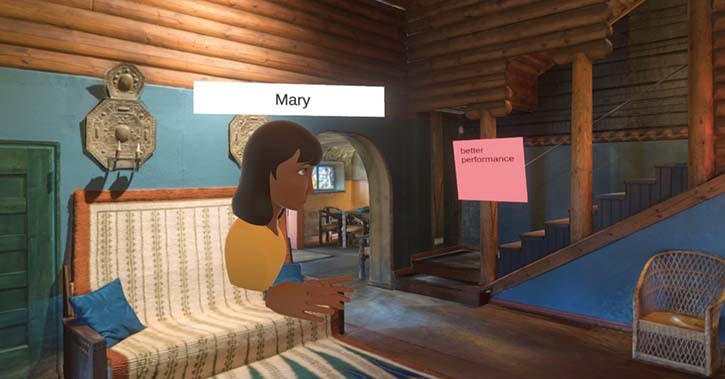 Participants don VR headsets, download the Glue app and go online using Glue’s own web service to enter a shared space where they can attend meetings with colleagues and clients, control their own avatars and interact with virtual scenes and tools. Thanks to AI, Glue’s avatars have become good at representing non-verbal communication, body language and the individual nuances that give a sense of who the person is. “It recognises your way of moving and talking – and there’s a very positive feeling you get from this recognition,” Parikka explains. He maintains that distributed teams seeking design validations or training sessions will feel far more ‘present’ using Glue’s meeting tools instead of a regular online video call. “When you share the same space, you can sense the presence of those other people. You can walk around, talk to different people, express yourself. Virtual reality more accurately represents the way people behave in meetings,” he says. The experience supports all the main VR headsets, including Oculus, HTC Vive and Windows Mixed Reality (Glue is in a partnership programme with Microsoft). But the experience is not just limited to VR. Participants can look into meetings without interacting on their desktop, mobile or iPad, and the firm has just released an audio-only version of the app on iOS and Android. Nailing the audio to give distributed working groups a sense they are all in the same room is equally important, according to Parikka. “We’re using spatial audio that allows you to more clearly isolate what each person is saying, which is great for larger groups and makes it possible to have simultaneous conversations,” he says. An oft-cited bugbear of online video conferencing is latency, but Parikka claims there’s only about a second’s delay. “Most people don’t notice. We transmit coordinates and audio. The experience is rendered locally [using Unity] on the user’s device – so it’s relatively lightweight data, not as much as a video conference call,” he says. Parikka, who is also the Finnish president of the international VR/AR association, VRARA, envisages that most of his start-up’s business will come from the training and education sector, as well as verticals reliant on design validation, such as architecture and maritime. Pricing for the app starts at €1000 a month per licence, and the 30-strong company is financing itself through a seed-funding round, which closed a year ago. The start-up is also an offshoot of an existing business – the VR and graphics agency Fake, which Parikka founded in 2004 after selling off an earlier advertising graphics business to NVIDIA. He adds that he’s currently in the process of divesting Fake into Glue. Glue hopes to release a free version of the product in the next six months, but immediate plans are focused on refining the product experience and making it more bespoke to particular industries. “We spent the major part of last year developing our own back-end stuff, because we didn’t want to become reliant on solutions that were not good enough for our use,” explains Parikka.